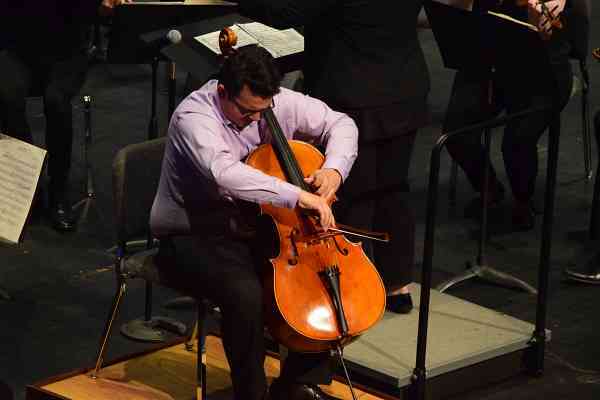 Born and raised in Fort Lauderdale, Florida, Franklin Sandoval began playing cello at the age of eight and began taking private lessons his senior year of high school as a student of Dr. Ismar Gomes. Since 2017 he started majoring in Music Performance at the University of North Florida in Jacksonville; in the studio of Dr. Nick Curry as a second year and first-generation college student. Franklin was awarded 4 superior medals by the Florida Orchestra Association Evaluations in both Solo work and Ensemble categories in 2013 and 2017. He is also a winner of the University of North Florida Concerto Competition 2017 with the Elgar Cello Concerto. Franklin was awarded Outstanding Undergraduate Musician award from The University of North Florida School of Music in 2018. Sandoval has participated vividly in chamber music performing string quartets, piano quintets, piano trios, oboe quartets, duets, and much more. His appreciation not just for classical music but the power of music is what motivates him and empowers his musical performances. Franklin has performed in many masterclasses given by artists such as David Finkel and Wu Han, Hans Jorgen Jensen, Soovin Kim, and The Vienna Piano Trio. Franklin has performed in several festivals and Orchestras including the New World Symphony Side by Side/Concerto Competition in Miami Beach, Florida, The Rushmore Music Festival in Rapid City, South Dakota, The Florida Youth Orchestra in Hollywood, Florida and most recently the Green Mountain Chamber Music Festival in Burlington, Vermont.